Wrapping up our wedding season in late October, I’m always hoping for a sweet finish to an awesome season. 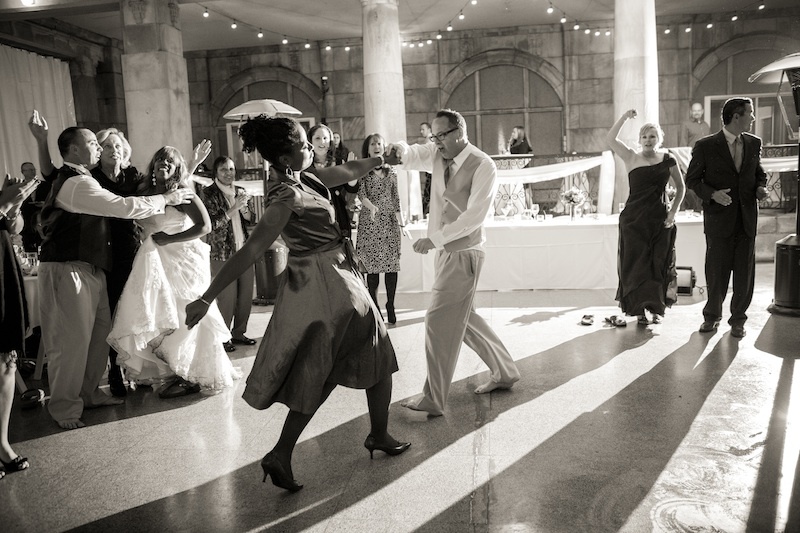 Our October 2012 weddings were so unique and didn’t let the at times chilly fall weather stand in the way of their outdoor wedding celebration. Although hoping for a beautiful beach ceremony near the St Joseph lighthouse, they made the decision to keep guests out of the cold and rainy weather and take to Plan B. I must say, I think this tops the list for being one of the most beautiful last minute Plan B ceremonies we’ve hosted! Wouldn’t you agree? Photos Courtesy of Jennifer Mayo Studios. I had such a great time collaborating with Monica + Devin, who knew exactly what they wanted their wedding to be and what impression they wanted to leave their guests with. 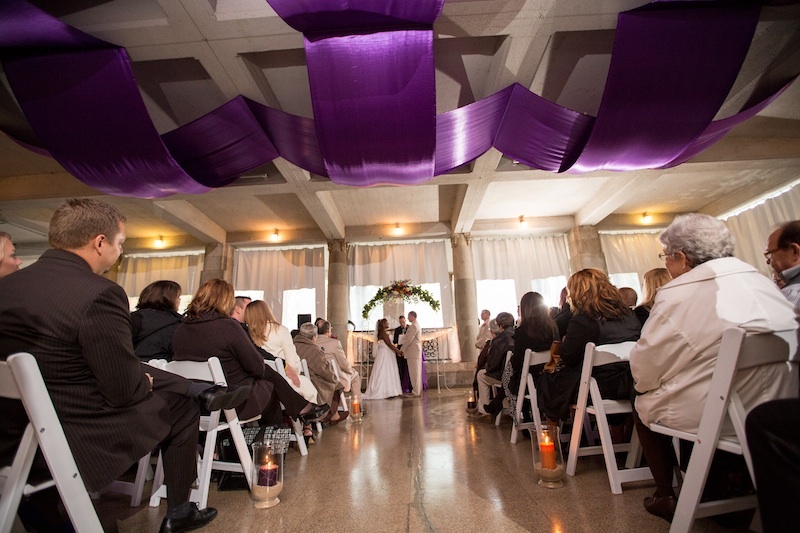 As a coordinator, I love when couples choose a bold color scheme in our space, and their fall wedding colors, plum purple with burnt orange accents, did just that. What a compliment to the architecture at The Veranda! Between the consistent, statement-making fall wedding colors, a well-thought-out reception layout, and a delectable dessert and chocolate fondue station, most all aspects were completely unique and screamed the couples personality. 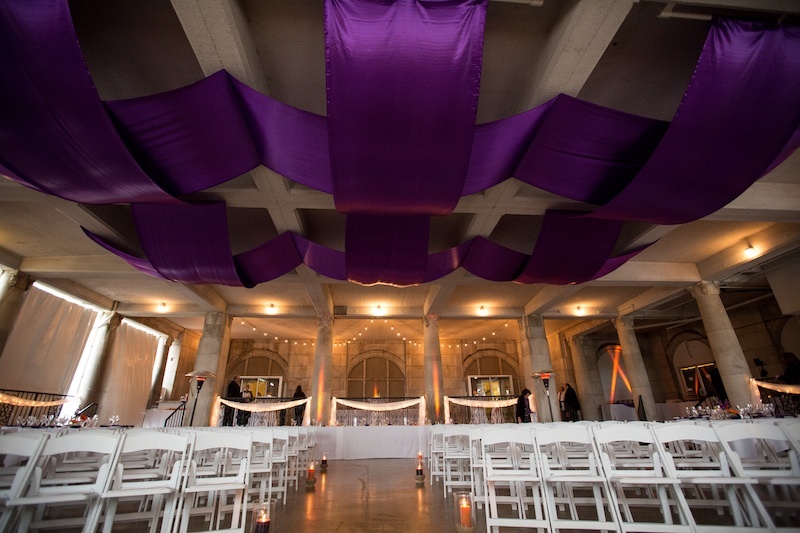 To top it off, the couple had an awesome bar concept with his and hers specialty cocktail drinks that fit their fall wedding colors perfectly: Purple Martini and Tequila Sunrise! What I also loved was their decision in toasting glasses. Not being champagne drinkers, they chose wine glasses that were etched in each of their favorite baseball teams: Monica: Chicago Cubs | Devin: St. Louis Cardinals! Quickly after dinner, guests put on their dancing shoes and stayed there for the remainder of the evening while Monica + Devin snuck away for a few minutes for a perfect nighttime shot on the glistening brick roads of downtown St Joseph. Check out their full wedding gallery here! The pictures say it all and how much they enjoyed themselves on their wedding day! We loved hosting you Monica + Devin on such a special day! Thanks for being so wonderful!